Categories follow a branching structure with broad categories acting as root level identifiers and child categories refining the product listing as the user drills down. For example, you could have a root level category called Apparel, then you could have three sub-categories called Men, Women, and Children. This screen will show you the root level categories of your store. The root itself is called Main. To add a new category click on the New button on the right. 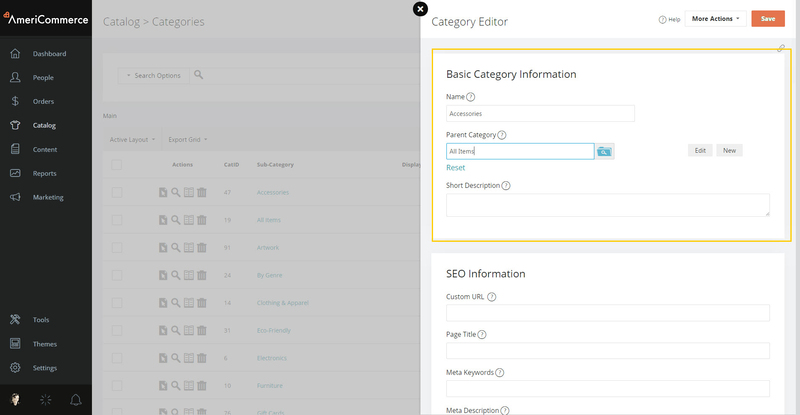 This creates a new category and opens the Category Editor. You can enter relevant information on this editor and Click Save to save the settings. Click on to save your category. Below is a more detailed explanation of the various fields in the category editor. This is the name of the category as seen by the users. You may want to use search engine optimized names as your categories; the name is also used in the URL if a custom URL is not defined. If this category has a parent category you can specify that here. By doing so this category becomes a subcategory of the category chosen as the parent. Either leave the parent category at its default, Main, or select another parent category from the list. 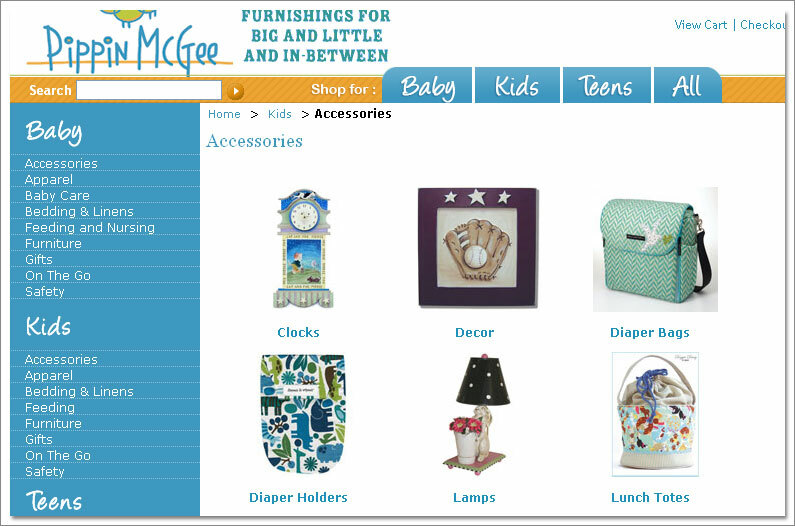 The maximum number of products from this category that can be ordered at one time. Set this value to 0 if you wish there to be no maximum limit. By default all category listings are sorted alphabetically. However, if you want a different sort order then you can enter numbers into this field to define which category comes first. If you do use this then you may want to enter values like 10, 20, 30, etc. as this lets you add categories in between existing categories. In the above image a thumbnail image was specified for the three subcategories Backpack, Duffle and Shoulder and make it easier for browsing for visitors. Another advantage of specifying images is that if there is no image for a product this image can be made to display in place of missing/unset product images. This option can be turned on on in Theme Settings. This is the full size image for the thumbnail image specified above. This image will display on the Category Page. The default image used for a product in this category if the product does not have an image associated with it. It will also apply to subcategories if the category context for that is active. For example, if you had a product with no picture and a parent category of Bags and a child category of Duffle, specifying this image for Bags would make it show as the default product image for products under the Duffle category. 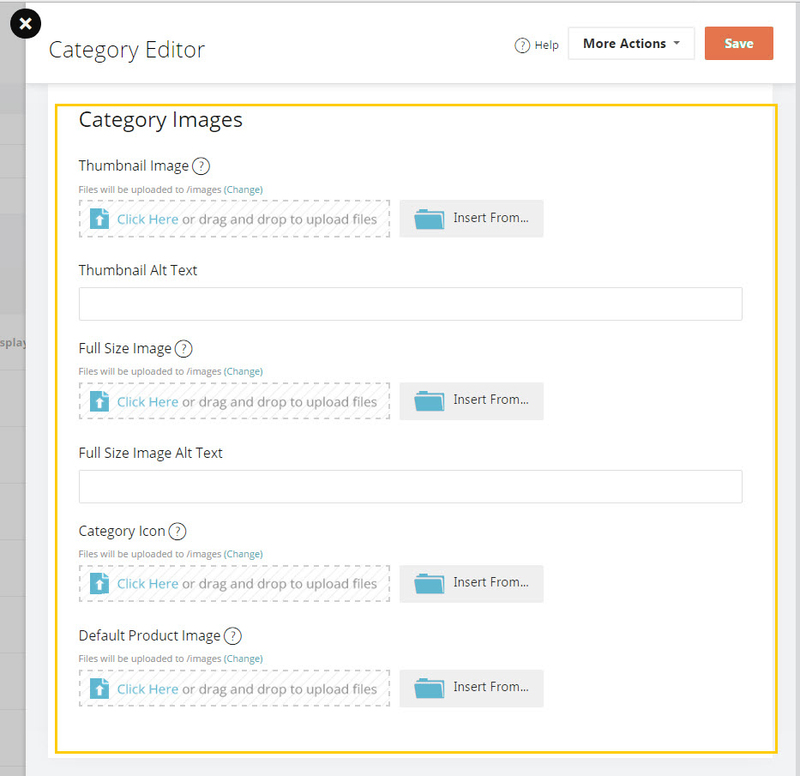 To activate this feature, go to the Theme Settings and enable the checkbox labeled Use Default Product Image from Category. Sometimes a large part of the stock can become unavailable or you may temporarily want to suspend offering products from certain categories. This option, if checked, allows a category to be hidden from customers. If this item is unchecked the category will be visible to customers. It will hide this category in searches, sitemaps, any where the category may be used. 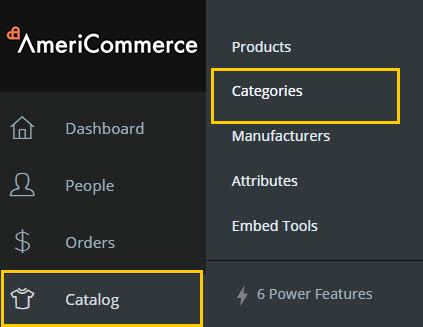 When enabled, this option will display all products in the active subcategories. This is the text that will appear in the title bar of the customer’s browser. Great place for search engine optimized key wording. You can enter your meta keywords and description for SEO purposes in these two fields. This data is not visible to your customers. This is a field for entering a brief description of a category, this description will be viewed by customers on the category listings. Show content from another file or URL within the frame in place of this category. Why? You may want to not actually show our normal grid of products and instead do something more creative that points to the products within this category. Yet you still want it in the catalog as a category since it will have products associated. You can show your page instead of the list of products like normal. Show a splash screen of products. Show or hide the products and sub-categories. This is typically used in conjunction with the External Content URL or Category Header. Every time you Save a category (new or old) the system generates a URL for it. Please ensure;that you add the / when entering a Custom URL. /backpack.html is correct whereas backpack.html is incorrect. Also note that the default URLs created by AmeriCommerce already contain the string /store/ in them. For performance reasons it is recommended that you do not use /store/ in your custom URLs. If you use Product Reviews, here you can choose to use a different rating group for this category. Allows you to add additional HTML to the head section on the category page. Enter any custom HTML that should be shown ABOVE the category listing. Category specific text and images are common here. This is a great place to add SEO text and images. A good thing to do is to create unique content from manufacturer;information for the category and place it up here nicely formatted with the a related image, it looks nice and is great for SEO. Enter any custom HTML that should be shown BELOW the category listing. Category specific text and images are common here. This is a less seen area of the category page, great spot for just a lot of SEO text, lots of content that the engines can read in about the category. Since it's seen less by the customers, the content does not have to be as polished as in header areas and can be geared more for search engine placement. You can add Snap-Ins above or below the category page. These Snap-Ins will show up only on this particular category page. 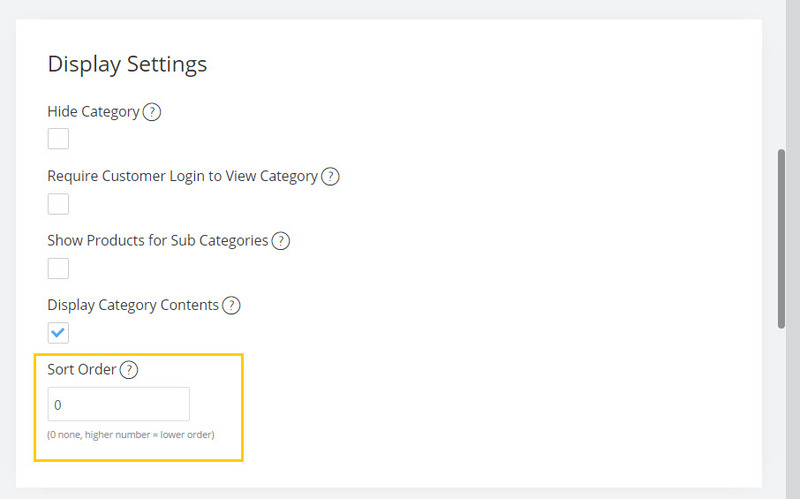 Click on the button to save and continue editing the category to save changes and go back to the category listing. Note: If you have a large number of categories to add, you can use the Data Import Tools under Global Settings to do so. It is helpful to add a few and export them to review the format you can use for importing. Please review the knowledge base article on 'Importing Data' for details on data imports. Can you import your products using only the CategoryIDs instead of having to do all the mapping of url's per item - this gets to be rather redundant and numbers are much easily added to the spreadsheet then several unique urls if you have cross style items flowing through for instance post earrings and gemstone earrings as an example - this would require 2 url's and 2 number sets for the category ids - are they not predetermined in setting up the categories so the id's are what the url's are in essence?